What is the future of Poland? President Lech Kaczynski among 96 people killed in a plane crash in Russia in April. 20 die in floods in Southern Poland in May. Presidential election goes to run-off between acting president and Kaczynski's twin brother. Warsaw, Poland (CNN) -- Poland is getting back on its feet after suffering an extraordinary few months of tragedy. The country is in the midst of an election sparked by the death of its President Lech Kaczynski and 95 other top figures in a plane crash in Russia in April. 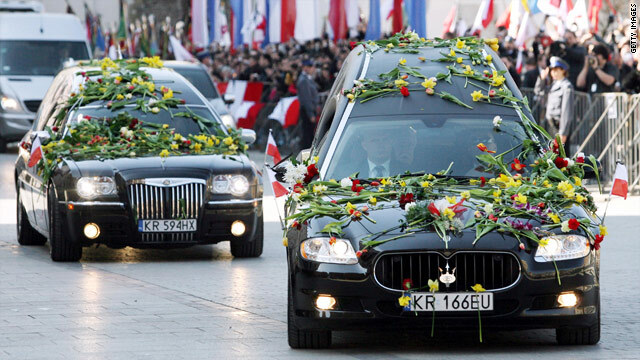 The dead included top generals, bishops, the head of the national bank, several deputy government ministers and President Kaczynski's wife Maria. They were on their way to commemorate the 70th anniversary of the Katyn massacre, in which 22,000 Polish prisoners of war were murdered by Joseph Stalin's secret police. The plane had been trying to land at Smolensk airport near Katyn Forest when it crashed. Aviation officials in Russia said the plane ignored Smolensk air traffic control commands to divert to another airport because of bad weather. Investigations into the cause are still ongoing. There's a saying in Poland, 'if you are scared, you get together'. Thousands of mourners lined up through the night to see Kaczynski's body laying in state alongside that of his wife in Warsaw's Presidential Palace. The couple was laid to rest in the famous Wawel Castle in Krakow, in a crypt normally reserved for monarchs and saints. Just a month after the plane crash left a nation in mourning, tragedy struck again. Massive flooding hit the south of Poland, leaving at least 20 dead and causing hundreds of millions of dollars in damages. Piotr Kaczynski, a researcher at the Center for European Policy Studies, said: "One effect of the two tragedies was that people started to trust all politicians and institutions more. There's a saying in Poland 'if you are scared, you get together'." Poland's recovery from its tragedies has been helped by its relative stability and prosperity, which is being felt throughout society. It was the only country in Europe not to slip into recession last year. Kaczynski said: "Poland is not the richest country in Europe, but its economic and social situation is pretty stable and the wealth has been distributed among the general public." Andrzej Rychard, Professor of Social Sciences at the Polish Academy of Science, said Poles were recovering from the raw emotion of the tragedies and feeling buoyed by the resilience of their economy. The tragedies have, however, led to a much tamer than usual presidential election campaign. Professor Rychard said: "The air crash and the floods have contributed to a very peculiar climate, a less aggressive and more silent campaign than usual." Presidential elections previously scheduled for the autumn were brought forward to June 20. The election produced no outright winner, so the two main candidates, acting President Bronislaw Komorowski and Kaczynski's twin brother Jaroslaw, will face each other in a run-off on July 4. Jaroslaw Kaczynski, a former prime minister, co-founded the Law and Justice party with his brother. Komorowski is running for the center-right Civic Platform, which is the party of the Prime Minister Donald Tusk. Though the president in Poland is primarily a ceremonial figure, he has the power to veto laws.